The South Side Mission’s newest resale shop in Peoria not only generates revenue to operate the nonprofit’s many ministries, it’s also a way to help the community. The newest of the Mission’s three thrift stores opened earlier this month at a former Aldi store at 603 E. War Memorial Drive. The organization purchased the property last spring for $1.2 million. The Mission’s two other resale stores, located at 3033 N. Sterling Ave. in Peoria and at 2125 S. Main St. in Morton, both operate on rented property. 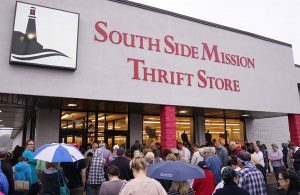 Another Mission thrift store on Pioneer Parkway in Peoria was closed before the new one opened. The stores generate about $1 million in sales yearly. The Mission’s annual operating budget is $4 million, with the rest of the funding coming from fundraisers and private donations. “We don’t receive any government funding at all,” Couri said. The stores also help the local economy by providing jobs, she noted. The new store has about 15 paid employees, while the other two have about 12 each. The Mission will be hiring a few more employees at the new store to run a recycling program. “Some of the things we can’t sell, we do recycle, such as cords from appliances that no longer work, metal pieces that can’t be sold and stained or damaged clothing. Our new location is giving us an opportunity to recycle more clothing, which is good because that does help bring in some additional funds to support our ministries,” Couri said. Recycling clothing at the new store will be easier because the building has a docking area for semi-trailer trucks. “We used to have to bag everything and throw it in the back of a truck, but now we can actually have the semi trucks drive up to pick up our bales of clothing,” she said. The Mission was able to purchase a clothing baler at a bargain price from Bergner’s when that retailer closed its stores this summer. A recycling broker finds buyers for the clothing, often foreign countries, Couri added. The stores also rely on volunteers to operate. Volunteer jobs include sorting through donations, hanging clothing, straightening racks, cleaning and even untangling donated jewelry. The thrift stores accept donations of gently used clothing, housewares, furniture, shoes, accessories and household goods, but not beds or mattresses. Shoppers may even sometimes find a car for sale at one of the stores that has been donated. The cars are usually donated to women in the Mission’s shelter but if no one is eligible to receive it, a donated car will sometimes be put up for sale. In addition to creating employment and offering the community vintage items at bargain prices, the stores also help the Mission provide “a hand-up rather than a hand-out,” said the Rev. Craig Williams, the organization’s executive director. Money raised from the stores help the Mission operate programs such as the New Promise Center women’s shelter, a culinary arts training school, a diner and food pantries for the underprivileged, services for the elderly and youth services, including after-school programs and the Camp Kearney summer camp for kids. The Mission is currently gearing up for its annual Thanksgiving meal, which it provides for anyone who can use nourishment and/or company. Mission staff and volunteers will prepare and deliver about 3,300 meals and serve about 200 more at the facility’s gym at 1127 S. Laramie in Peoria. For more information about the South Side Mission and its programs, thrift stores and volunteer opportunities, call (309) 676-4604 or visit the website at www.southsidemission.org. The thrift stores are open from 9 a.m. to 7 p.m. Monday through Saturday and accept donations until 6 p.m.
To arrange for pick-up of large items, call 309-635-6278.